Electric trucks, a niche market a year ago, are turning into a full-fledged industry as major players such as Daimler, Mack and Tesla throw their hats into the electric trucking ring. Just in the past month, all three announced plans to move into heavy trucking, assuring that a flood of investment dollars will go into weaning trucks from carbon-based fuels. They join other players — such as Chinese vehicle maker BYD and the fledging Nikola Motors truck company — also pushing into electric big rigs. But even so, analysts say the speed at which automakers will be able to produce trucks and the pace at which the trucking industry adopts them will be slow at least through the next decade. “Consumers tend to be more aggressive with new technology, but the trucking industry always has been conservative when it comes to new drivetrains,” said Colin Rusch, managing director of research at New York-based investment bank Oppenheimer & Co. The technological and logistical challenges include getting enough battery life to make transporting heavy loads viable and making the price of the vehicles affordable, analysts said. It’s unlikely that companies will purchase electric vehicles in large quantities to start, Rusch said. Executives at large fleets would probably purchase one or two of the vehicles to ensure the new technology works well enough to warrant more purchases. For now, environmental regulation looks to be the main driver fostering electric truck development. The California Air Resources Board, or CARB, last week issued its final draft of the California Sustainable Freight Action Plan, a blueprint for reducing pollution and greenhouse gas emissions created by the state’s freight transport system. It calls for the deployment of more than 100,000 trucks and other freight transporting equipment capable of zero-emission operation by 2030. E-trucks will be necessary for California to meet that goal while other governments increase restrictions on the amount of pollutants vehicles put in the air, said Andy Swanton, the director of business development for BYD. The company has orders for about 64 port and drayage trucks that are used to move containers around ports in Los Angeles that were partially funded by grants from the CARB and the California Energy Commission. BYD already has 500 light- and medium-duty electric vehicles in service in China, including cargo vans, street sweepers and garbage trucks. Diesel trucks are a major source of nitrogen oxides, or NOx emissions produced in the U.S. NOx is a smog- and ozone-causing product of fuel combustion that is particularly difficult to eradicate. Highway vehicles produce about 36 percent of NOx emissions in the U.S., according to the Environmental Protection Agency. Most of that is from diesel trucks and buses. But replacing diesels with electric trucks will be a long and challenging task, industry analysts said. Electric vehicles will make up just 1 percent of the entire trucking market by 2020, according to industry research firm IHS Markit. That will grow to 10 percent a decade later. Electric trucks will make up higher percentages of overseas markets — up to 10 percent in the European Union and Japan by 2030 and as much as 12 percent in China, IHS researchers say. Tesla Motors Chief Executive Elon Musk said last month that the electric car company was designing a truck, a pickup truck and a bus. “We believe the Tesla Semi will deliver a substantial reduction in the cost of cargo transport, while increasing safety and making it really fun to operate,” Musk said. Musk provided no other details except to say the vehicles were in the early stages of development. He said the truck would be unveiled next year. Tesla will unveil nothing more than a rendering of its Tesla Semi next year rather than an operational truck because it will take years to develop such, said Rusch, the Oppenheimer analyst. A Tesla spokesperson didn’t return calls seeking comment. Nikola is developing a natural gas-electric hybrid vehicle that’s set to be unveiled Dec. 2. A road-ready vehicle will be ready in 2019, Milton said, which would make it among earliest electric trucks to hit the road. The company is named after Nikola Tesla, among the fathers of modern electricity, the same as Tesla Motors. The two aren’t related despite the similar nature of their businesses. Daimler, the owner of Mercedes-Benz and a major builder of diesel heavy-duty trucks, said last month that it plans to sell a zero-emission truck capable of pulling up to 26 metric tons. That would put it in the same realm as traditional diesel-powered vehicles. The so-called Urban eTruck is set to be launched at the “beginning of the next decade,” the company said without giving a specific year. Daimler Trucks said it would have a full-electric drive, enabled by technological advances that will make e-trucks a realistic alternative to traditional diesel-powered vehicles. 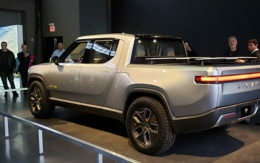 The expenses of developing electric vehicles have declined, as has the time it takes to charge the batteries to power the trucks, according to the automaker. Moreover, technological advances are making electric vehicles more capable. “The time is ripe for the electric truck,” Daimler said in the statement. Even Mack Trucks, with its signature bulldog leading the way, recently unveiled an electric garbage truck at a waste conference in Las Vegas. The powertrain was developed by San Jose, Calif.-based Wrightspeed Inc., owned by Tesla co-founder Ian Wright. He was the former vice president of vehicle development and left the electric car company in 2004. Big, well-funded names such as Daimler and Mack moving into the business should help accelerate development of electric trucks of all sizes, said de Vleesschauwer, the IHS analyst. That can only benefit smaller companies such as Nikola, Milton said. Tesla’s announcement was “incredible news” for Nikola, and the entry of Mack and Daimler into the e-truck space only adds to the “legitimacy” of Nikola’s ideas and developments, he said. At the same time, new entrants to truck manufacturing such as Nikola, Tesla and Otto, a self-driving truck company, will change the face of trucking, Ravi Shanker, a freight transport analyst with Morgan Stanley, wrote in a recent report to investors.